Windows 8, Windows 7, Server 2008, and flavors of Windows Vista provide an unpublished ability to create a control panel called GodMode that allows you to have easy access to almost all administrative tasks that you would like to use in Windows. This new window is called GodMode because it puts all aspects of the management of Windows at your fingertips in one location. 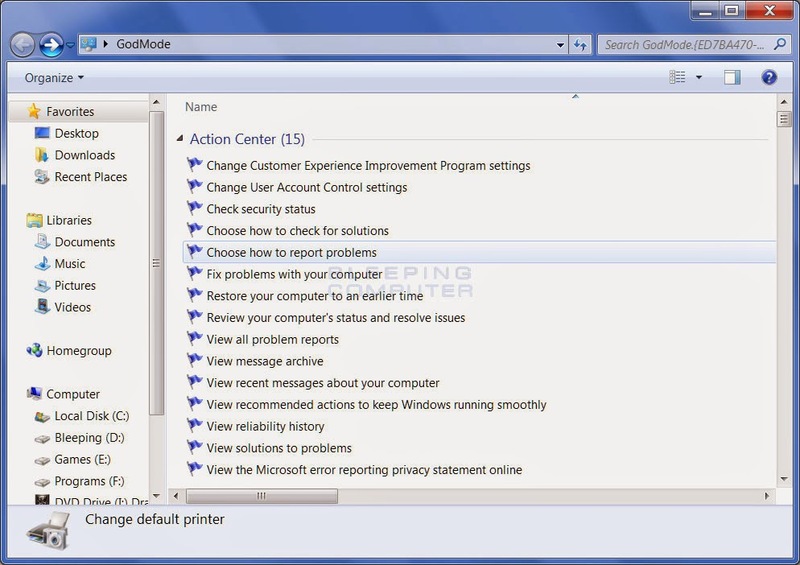 This allows you to quickly configure Windows settings or hardware from one screen. In order to access GodMode you must first create a special folder on your desktop as described below. It is important to note that GodMode only works for 32-bit and 64-bit versions of Windows 8, Windows 7, 32-bit versions of Windows Server 2008, and 32-bit versions of Windows Vista. It is know, though, to crash Windows Vista 64-bit, so please do not create this folder on those versions of Windows Vista. If you decide to test it on 64-bit versions of Windows Vista, you may need to reboot into safe mode to remove this folder. To enable the GodMode folder on your desktop, please follow the steps below. Close all open windows so you are at your desktop. Right-click on an empty portion of your desktop and select New and then select Folder as shown in the image below. 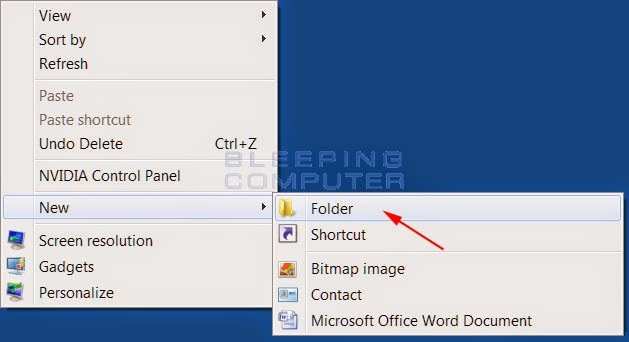 A new folder will appear on your desktop with the title of the folder in edit mode as shown below. 3. Edit the title of the new folder so that it is named the following and then press enter. 4. When done, you should have an icon on your desktop that has the above title and looks like the icon in the image below. 5. Double-click on this icon to open GodMode. When GodMode opens, you will be presented with a screen similar to the one below. You can now scroll through the list of available configuration options and tasks that are available for your version of Windows and tweak Windows from one location. If at any time you would like to remove GodMode, all you have to do is delete the folder you created.